While all of my dogs have occasionally eaten grass, Gina is absolutely obsessed with chomping on greens. She’s 6 years old, and I’ve observed this behavior since I adopted her at 16 months. 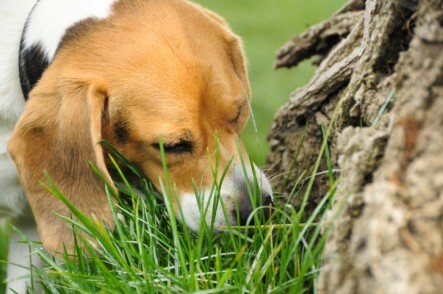 There’s an old myth that dogs eat grass when their stomachs are feeling queasy to cause them to vomit. But, I’ve known this isn’t the truth with her, because she eats grass daily and has no digestive problems. I was intrigued with Stanley Coren’s post in Psychology Today on the topic. Coren refers to the only research study that has surveyed dogs to find out if their grass eating habits are related to illness or dietary deficiency. The research study took place at The University of California, Davis and was published in Applied Animal Behavior Science in 2008. The survey initially observed the grass eating behavior of about 75 dogs belonging to both veterinary students and patients at the UC Davis teaching hospital. When questioned about their dog’s behavior, illness and vomiting were very rarely involved in grass eating. This was followed by a larger sample of over 1,500 dogs, 68 percent of which ate grass regularly. 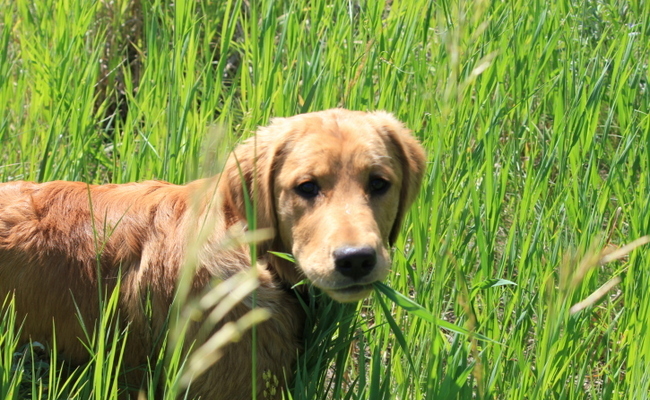 Younger dogs were found to eat grass more frequently. While very few dogs showed signs of illness before eating grass, results showed that dogs who were displaying signs of illness were more likely to vomit after eating grass. While it’s still unknown whether dogs eat grass because it was originally known to purge intestinal parasites in wolves, or it’s just because they like the taste of grass, we now know that you don’t have to worry about rushing Buster to the vet after he’s enjoyed making a salad out of your backyard. However, there are exceptions. 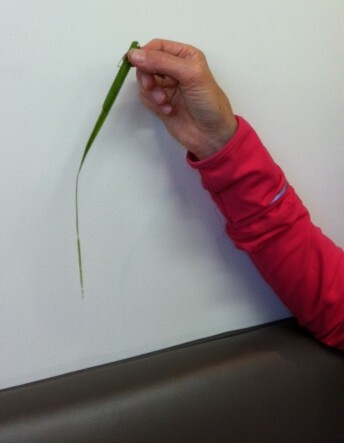 A few years ago, Gina swallowed a very thin, long sawblade piece of grass. She was coughing up blood within an hour and a scoping procedure was administered at the Emergency Vet to remove it. In her case, it actually did save her life. While I still let her enjoy chomping on her greens, I’m just careful to make sure it doesn’t include sawblade grass. Personally, I also wonder if dogs eat grass more often when they see other dogs eat grass. Before adopting Gina, Sanchez rarely ate grass. In the past six years since she’s been in our family, he has seemed much more interested in eating grass daily. If your pups are enjoying their grass salads during walks, you no longer need to worry about their stomachs. However, make sure the grass they are chomping on is free of pesticides and chemicals.